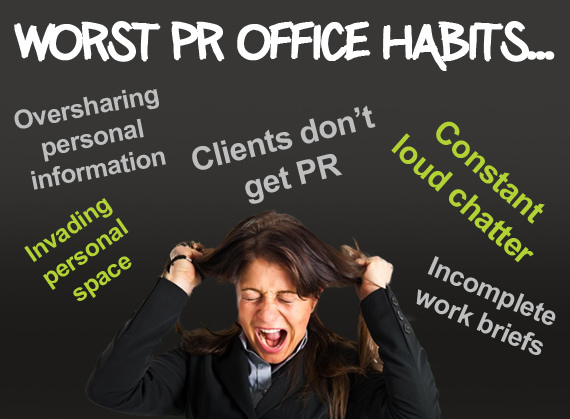 The 3 most annoying PR office habits decoded! Enter a PR office and on the face of it everything’s normal. But just beneath the surface of the motivational posters, bean bags and the trendy open cubicles lies a range of office habits; designed to get your stress levels up faster than you can say “client social media crisis”! Due to a consensus among PR pros, we have decided to leave bosses out of the list of annoying office habits! It’s NOT the sound of music! Yes, we Indians like to talk and we are loud. And this is precisely what brings us to annoying habit number 1. Geetika says her solution is to always try to do media pitching alone, where someone is not around. She says she steps into a lobby sometimes to be alone. Geetika feels this helps her in being more confident and concentrating better. Clients still don’t get digital media! If too much noise grosses you out, try a stint at a TV news room. I guarantee you will be able to work through an earthquake! Compared to a TV news office, PR offices are tame!